The Narcos nightmare keeps getting worse. Amid fallout from news of a slain location scout, Netflix is also weathering an ongoing trademark dispute with the family of Pablo Escobar, the Colombian drug lord who was once the show's focus. In a recent interview with The Hollywood Reporter, Escobar's 71-year-old brother, Roberto De Jesus Escobar Gaviria, ratcheted up his family's rights claims, threatening to "close their little show" if Netflix keeps refusing to pay royalties. The dispute began last July, when Gaviria sent a letter to Netflix demanding $1 billion for using his company's trademarks -- which include "all the trademarks to all of our names and also for the Narcos brand" -- without proper permission. "Netflix are scared," he told the trade. "They sent us a long letter to threaten us." When reached for comment, a representative for Netflix told Thrillist, "We have no response on this matter." The letter calls the rights claims "fraudulent," but officials at Escobar Inc., Gaviria's company, believe Netflix is starting to reconsider. "At first, they refused to acknowledge us. After we registered all the trademarks and we've been granted some of them, they sent us a cease-and-desist letter. After that our attorneys and their attorneys have come to an agreement that basically they need to pay us something. 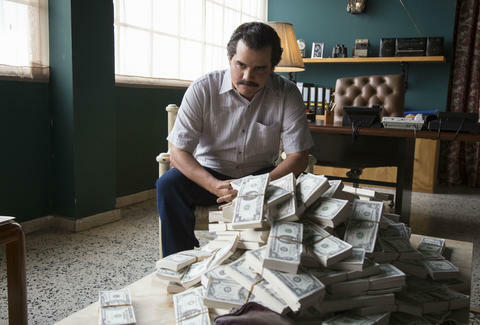 Now it's a matter of determining how much that something is," Olof Gustafsson, CEO of Escobar Inc., told THR. "At the end of the day, if we don't take a deal, then we own the trademarks. They would have to rebrand their entire show." Following the death of Carlos Muñoz Portal, Narcos's location scout, Gaviria told THR that the producers should consider using "hitmen ... as security." When asked if he thought Colombia and Mexico were too dangerous for shoots, he added: "I don't want Netflix or any other film production company to film any movies in Medellin or Colombia that relates to me or my brother Pablo without authorization from Escobar Inc. It is very dangerous. Especially without our blessing." Muñoz was scouting in Mexico for the show's fourth season, about the country's Juarez cartel. The third run, which chronicled the shift of the drug wars to Mexico, debuted on Netflix at the beginning of September. "We can't do [the show] if it's not safe. We're talking about lives," star Pedro Pascal told TMZ this week. "If they want to do it, they'll figure it out in a safe way."